The Sonoma County Winegrowers are proud to announce our selection as one of Northbay Biz Magazine’s 2015 Game Changers. 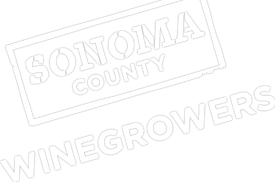 This is an incredible honor and a testament to our hard working grape growers who have been recognized for their sustainability efforts and contributions to making Sonoma County an incredible place to live, work, and play. The Game Changers is an annual award giv en to individuals and organizations that are significantly shaping the future of the North Bay in a positive way. “The Sonoma County Wine Country, fertile lands of rolling, vineyard-covered hills bordered by woods, cooled by ocean breezes, with a river running through, is about as varied and idyllic a setting as one can imagine for raising the fruit that fills a glass of world class wine. Perfect as the picture is, Sonoma County Winegrowers wants to go one step further. It wants to secure the health of the land, the culture, the business-now, and for the future. In 2014, after careful deliberation and with passionate support from key stakeholders, SCW’s Board of Directors announced to the world its goal to make Sonoma County the nation’s first 100 percent sustainable wine growing region. “It’s an exciting goal,” says Rep. Mike Thompson (D-St. Helena). I think if anybody can do it, Sonoma County can. It’s really set the mark on environmental issues over the years, from power generation to stream protection. It’s a game changer-not just for Sonoma County, but for wine communities and agricultural communities across the country.” And thanks largely to the energy and vision of SCW President Karissa Kruse, it’s already passed the half-way mark. Click here to read full feature story. You can also pick up a copy of the magazine at select grocery stores and bookstores across Sonoma County.